Sustainable methods of travel will also help us work towards lowering our energy consumption. 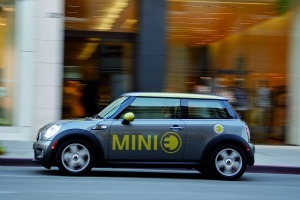 Electric vehicles may be one answer to this and BMW have been developing an electric version of its popular Mini, the MINI E. Throughout this complex project, and supported by a £6m fund from TSB, BMW’s principal academic partner has been Oxford Brookes University. The MINI E project required a multi-disciplinary approach to research, to interrogate the technical issues as well as to fully understand the social and psychological aspects of driving electric cars. Oxford Brookes was well placed to carry out this work due to its strengths across a range of disciplines. As part of this work, BMW and the University conducted a trial of 40 vehicles with 138 private and fleet drivers and combined objective data logger information with subjective driver data. The early project findings informed development of the 2011 BMW Active E, an electric derivative of the BMW 1 Series Coupé in preparation for the 2013 version of the car. The University’s research was extended substantially across the whole of the TSB’s ‘low carbon vehicle demonstration’ programme. This research also provided the first insight into the expectations and experiences of private and fleet drivers of electric vehicles, which posed many questions; How would private and company motorists and fleet managers get on living with a different type of car? What were their preconceptions, their real experiences and their attitudes towards a different style of motoring? Might there be unexpected benefits from having an electric car? What are potential barriers to the uptake of this type of car? What type of support is needed for drivers?